MicroStrategy promises quick-to-deploy data-discovery and departmental capabilities that sync with its venerable, enterprise-scale platform. MicroStrategy has flourished at the top of the BI market for more than two decades, specializing in enterprise-wide deployments at truly high scale – supporting thousands and, in some cases, tens of thousands or even hundreds of thousands of users. As smartphones and tablets emerged in the 2008-2011 timeframe, MicroStrategy was the first mover. To this day MicroStrategy remains at the forefront of delivering mobile BI capabilities with fluid, device-native interactivity. The shift that MicroStrategy largely missed (along with many other established BI vendors), was the rise of agile, self-service capabilities aimed at mainstream, departmental and line-of-business users. That’s the void that Tableau, Qlik and, more recently, Microsoft PowerBI, have happily filled. Like other established vendors, MicroStrategy responded with ad hoc data discovery and data visualization capabilities of its own. Yet many MicroStrategy customers bowed to grassroots demand and embraced third-party self-service options for their ease of use. What the self-service crowd learned, as use of their tools spread, is that high-scale deployments and establishing a single source of truth are not so simple. These vendors have been adding data-governance features, administrative controls and management capabilities to turn tools into what they now describe as platforms. Part of delivering on that promise rests on the product. MicroStrategy Dossier, introduced last fall, goes beyond dashboards to deliver collaborative analytical applications and workbooks. A revamped MicroStrategy Desktop interface introduced at the World event better supports data discovery. And a new Workstation interface was added to help power users quickly build and scale up enterprise content. Detailing the roles that should be in place, for example, Saylor said organization should have a lead analytics architect – just one person in charge — to create, publish and optimize the data layer so there aren’t multiple versions and interpretations of the truth. And there should be a lead application architect – again, a single point person – who sets standards for analytical applications so there aren’t overlapping and conflicting approaches that contribute to performance problems. 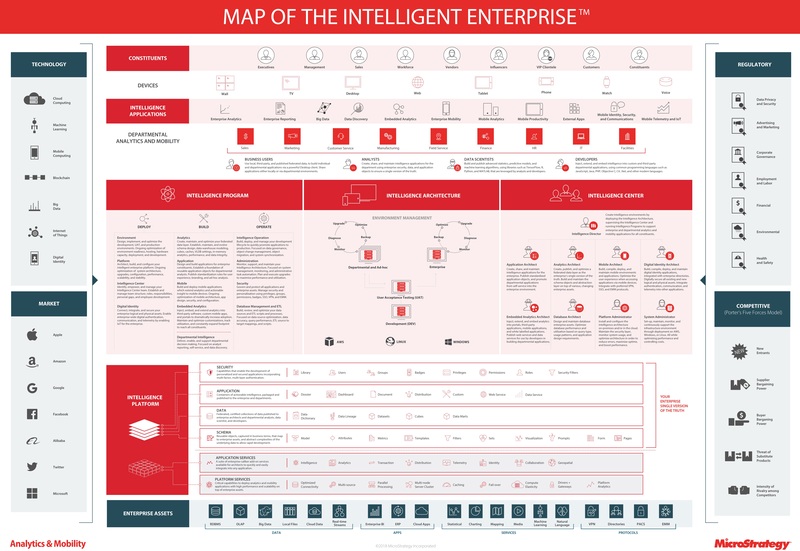 Large enterprises tend to have most of, if not all, the architectural and administrative roles detailed in MicroStrategy’s Map of the Intelligent Enterprise, Saylor told me. But where deployments have failed, where performance is not as expected and where data inconsistencies have cropped up, Saylor said MicroStrategy tends to discover overlapping responsibilities and inconsistent standards, interpretations and approaches. To address these breakdowns in best practices, MicroStrategy has stepped up its educational resources, including free options, for both customers and partners who can help customers get the most from their deployments. It’s also eyeing certifications and more community based training opportunities, but the first step is raising awareness of the resources already available. MicroStrategy World presented what I saw as an honest discussion of what’s required for customers to get to proverbial intelligent enterprise. Instead of pretending that products alone can deliver success, Saylor stressed that MicroStrategy’s improved ad-hoc data-discovery and departmental capabilities will be no better than disconnected Excel spreadsheets or Tableau dashboards if they don’t draw on a single source of truth and are not synchronized back to the enterprise environment as usage scales up. MicroStrategy’s vision for how ad hoc and departmental assets draw from and sync with the enterprise as the scope of consumption grows. I got the sense that most of the attendees of MicroStrategy World — more than 2,000 executives from enterprise customers ranging from AIG, Coca-Cola and Merck to Citi, Optum and UBS – were comfortable with what I would characterize as top-down messaging aimed at executives, analytics leaders, project managers and administrators of high-scale, enterprise-wide deployments. As for the ease of use and agility of the new ad hoc and departmental tools, including Dossier, Desktop and Workstation, these were briefly demonstrated during Chief Technology Officer Tim Lang’s second-day keynote, but it was a fleeting glimpse. Yes, there were detailed track sections and hands-on workshops for those interested, but if MicroStrategy is truly serious about retaining (or regaining) the self-service ad hoc and departmental workloads, it could do a better job of demonstrating and even celebrating its “massive departmental productivity” on the main stage. Show me, don’t tell me. Let the live and video-taped customer testimonials include more front-line analysts, Dossier builders and ad hoc explorers rather than just the top-dog analytics executives. The passion at MicroStrategy World was most evident around what MicroStrategy has always done best — providing the platform for powerful analytical applications deployed at high scale. The company’s prowess with a variety of consumption options was also on display, now extending from multi-screen conference room displays at the high end down to smart phones and smart watches. MicroStrategy is also pushing the envelope of voice interaction, with Saylor describing Amazon Alexa as the third most important platform to emerge after iOS and Android. Here’s where MicroStrategy and others could start to redefine self service. As I note in my recent report, “How Machine Learning and Artificial Intelligence will Change Business Intelligence and Analytics,” line-of-business users don’t necessarily want to have to open up a report or interpret a data visualization. And as the speed of decision making increases, there may be no time for such interaction. In that world, users will want to be able to simply ask questions and get precise answers and recommended actions. Previous Amazon Web Services Adds Yet More Data and ML Services, But When is Enough Enough?